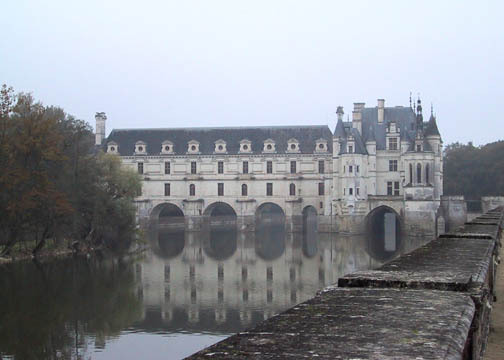 A romantic pleasure palace, Chenonceau was created from the Renaissance onwards by a series of aristocratic women. 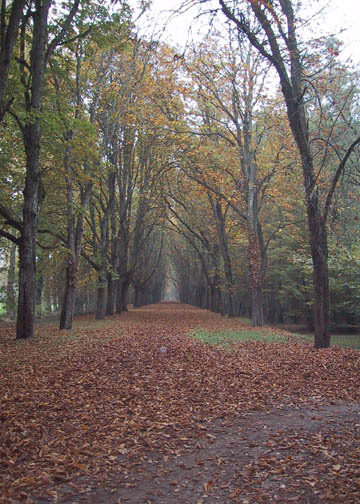 A magnificent avenue bordered by plane trees leads to symmetrical gardens and the serene vision that Flaubert praised as "floating on air and water". The château stretches across the river Cher with a 60m gallery built over a series of arches, its elegant beauty reflected in the languid waters. The grandeur continues inside with splendidly furnished rooms, airy bedchambers and fine paintings and tapestries. 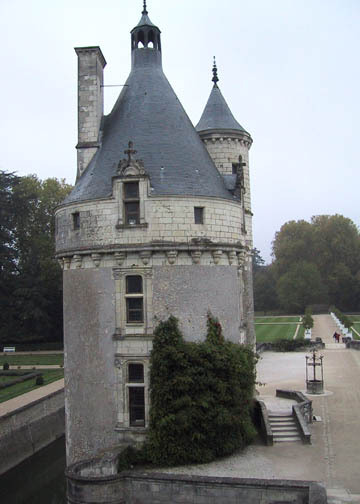 By building Chenonceau on the Cher in the 16th century, Thomas Bohier razed the castle-keep and the fortified mill of the Marques family only keeping the donjon: The Marques Tower, which he transformed in Renaissance style. The forecourt reproduces the layout of the former medieval castle demarcated by the moats. Next to the Tower there is also the well decorated with a chimaera and an eagle - the emblem of the Marques family. 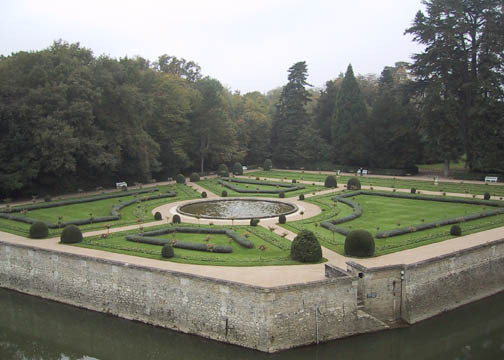 To the right of the entrance and the Marques Tower is the more intimate Garden of Catherine de Medici (below left), with a central pool and from which we discover the West facade. The Garden's floral decoration changes in the spring and in the summer needs 130,000 bedding plants grown on the Estate to be planted. Lining the Court of Honour, the Domes Building (not shown here), from the 16th century, formerly housed the Royal Stables and the silk worm farm introduced into France by Catherine de Medici. 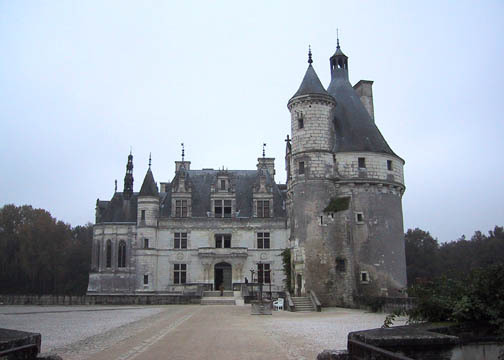 Around the castle, you will also find a 16th century farm and a 70 hectare park. 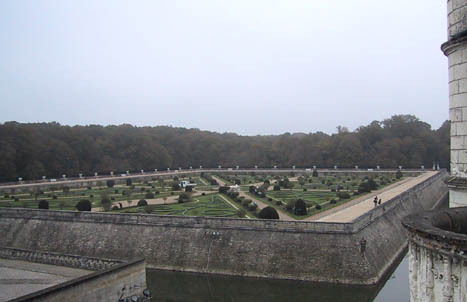 To the left of the entrance lies the Garden of Diane de Poitiers (below right) whose entrance is commended by the Steward's house: the Chancellery, built in the 16th century. This garden is protected from the Cher by elevated terraces from which there are beautiful views over the borders and over the château. Walking toward the castle, built on the piers of the former fortified mill, you will discover the monumental entrance. 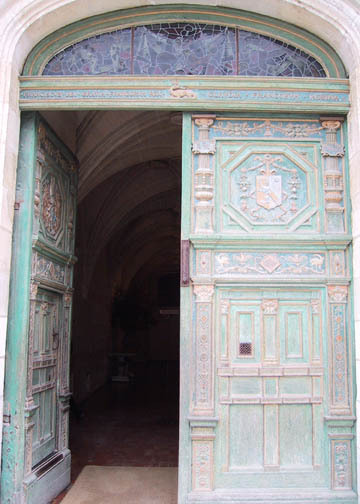 Dating from the period of François I, made from sculpted and painted wood, it has, on the left, the coat of arms of Thomas Bohier, on the right those of his wife, Katherine Briçonnet - the builders of Chenonceau - topped by the Salamander of François I and the inscription "François, by the grace of God, King of France and Claude, Queen of the French.